I have been trying to master a few recipes in the last week. From making brioche to different pastry types to muffins. Let’s just say it hasn’t gone too well. I can now admit, that brioche is not as easy as people claim and after four attempts, I failed dismally and vowed never to make it again. I’ll just have to buy it from now on. Such a shame but I refuse to get caught up in my failures. Next was an attempt to make different types of pastry. I have always wanted to make croissant pastry and Danish pastry at least just once in my life to say I did it. Well, lets just say that also didn’t go too well. My Danish pastry was nice but was a little too close to croissant pastry for my liking and my croissant pastry wasn’t as light and flakey as I had wanted. C’est la vie! However, there was one saving grace…’le muffin’. Thank goodness for these small individual cake like treats! I experimented with double chocolate muffins, banana muffins and very berry muffins, all turned out quite well but by far the best were the berry muffins. 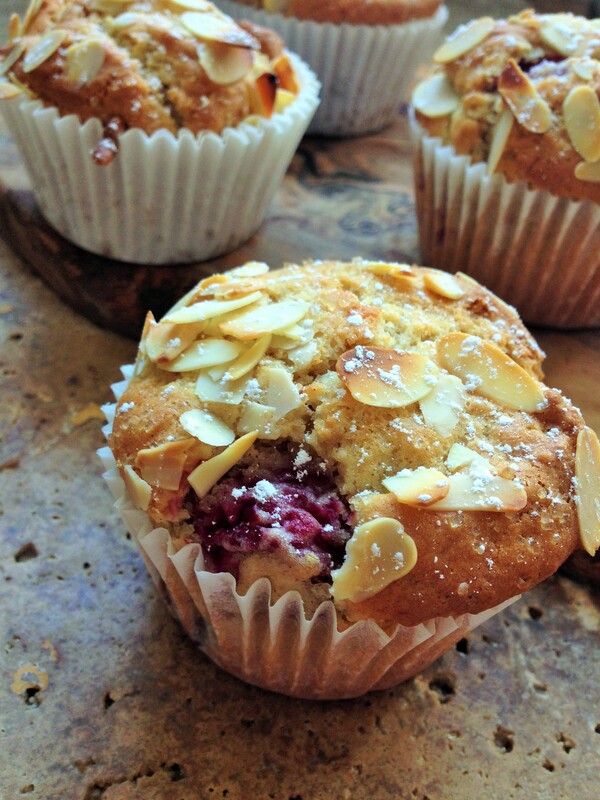 Light, fluffy, moist and full of flavour and berry goodness. At least one thing worked for me this week. I had thought originally that one master muffin mix would suit all muffins. Sadly this is not the case. You have to change the ratio of dry to wet ingredients, depending on what variety you make. There is no getting around that one. I recently asked my followers what they looked for in a muffin. The best response and the one that inspired this recipe was “an overload of warm berries that are about to burst from being heated in the oven”. Thank you dear reader for helping us out! 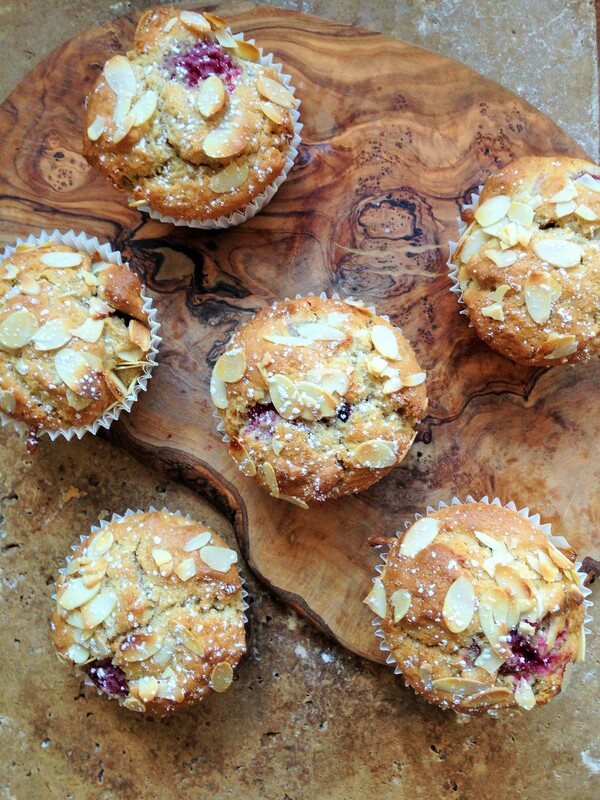 So having made many a batch to find the ultimate recipe, I can now share with you my blackberry, raspberry and almond muffins. The trick to a good muffin is to double sift the flour, and then when incorporating the wet to dry, VERY gently fold them together and don’t over work the mix. 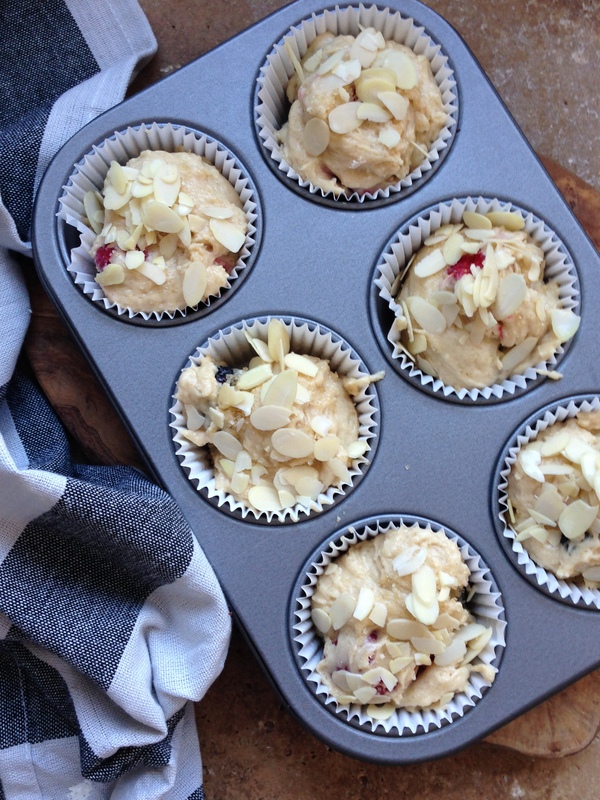 This gives the lightness to the muffins. I also give the muffins 5 minutes at a high temperature to give them a boost (this makes them nice and tall) and then reduce the oven temp for the remaining time to cook the insides properly. Pre heat the oven to 200 C (fan oven)/220 C non fan and line a muffin tin with muffin cases. In a large bowl, sift the flour. Return the flour to the sieve, add the baking powder, salt and cinnamon and sift again. Set aside. In a smaller bowl, whisk the eggs and sugar together. Add the milk, yogurt, oil and vanilla and almond extracts and whisk again. Fold the wet ingredients into the dry ingredients, very very gently. It will be slightly lumpy, don’t worry this is a good thing. Add the berries and fold in very gently again. Spoon the mix into the prepared cases, fill the cases right to the top. Sprinkle with Demerara sugar and flaked almonds. Pop into the oven for 5 minutes. Then turn the oven down to 170 C (fan)/190 C (non fan) and cook for a further 20 minutes. If like me your oven browns one side quicker, turn the tin around half way through. When they are golden brown and the inside isn’t wet (check by sticking a skewer into the centre and removing, if the skewer comes out clean, they are done), remove from the oven and allow to cool in the tin. And bob’s your uncle, they’re ready to eat! Thanks Gillian, I trust Nigella and her baking so I must give it a try ! Worked great for me a novice! Any tips on getting an even distribution of berries welcomed! sadly there is no great tip for even distribution that I have discovered. I think it comes down to when spooning the mix into the cups, just do it by eye. I’m often found standing over them making sure each one has a decent amount of fruit, hilariously!